Well there goes a lesson learnt…be careful what you wish for…never again will I envy the sunny weather down south. No more giving the rain a bad name. 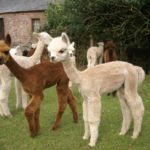 Never again will I complain about washing and drying all the cria coats, that I normally have to use. I missed my wellies. Six weeks and no rain. The farm was looking like an African landscape…and then the heavens opened…hooray! We had puddles. 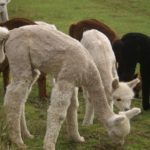 We now have green grass, and a temperature which is much more bearable for alpacas and humans alike. 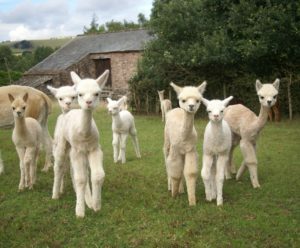 We have always though that our lush green grass of the Eden Valley played a significant part in our good birth weights, and this would appear to be true, with our later born birth weights well down on our average. We set off the year with many weighing in at 8-9kgs newborn, and ended the year with the majority around 7-7.5kgs. 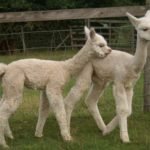 We had our heaviest and our lightest cria of the year born on the same day. 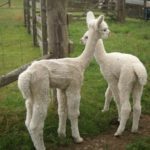 Both full term (and of average gestation for the dams) Bozedown Magic Charm had a male weighing in at 10kgs, and Cambridge Stargazer a female weighing in at 4.9kgs. 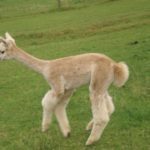 Magic Charm’s boy, sired by Beck Brow Explorer, has been given a place on the leader board for Quality Cria of the Year. 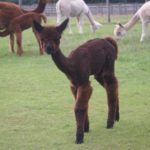 Whilst Stargazer’s cria, sired by Beck Brow First Edition, has without any question of a doubt, won the Most Adorable Cria of the Year award. She had no idea that she was small. She just got stuck in to the rough and tumble from day one. Smitten Kitten (as we have named her) is now 8kgs at 3 weeks old, and still super cute. 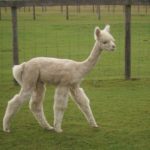 That’s enough…I feel guilty now…I should not leave any one out…we are fortunate to have had such a lovely drop of cria, with such diverse top notch genetics, who appear to be thriving and enjoying life. 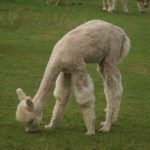 Well when I say enjoying life, maybe not quite so much on cria shearing day…the loss of dignity…the sneering and pointing when you look like a walking lollipop…but then they realise that they all look ridiculous. Our shearer left quite a bit of fleece on the face this year, in the hope of aiding the dam’s acceptance of their cria post shearing. This did make them look especially amusing, as you can see by the photos (click to enlarge). I have since tidied them up. 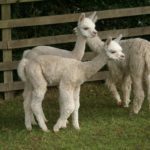 We had three dams from 30, who needed a little extra time in the pen with their cria, but all were completely reunited within a couple of hours. 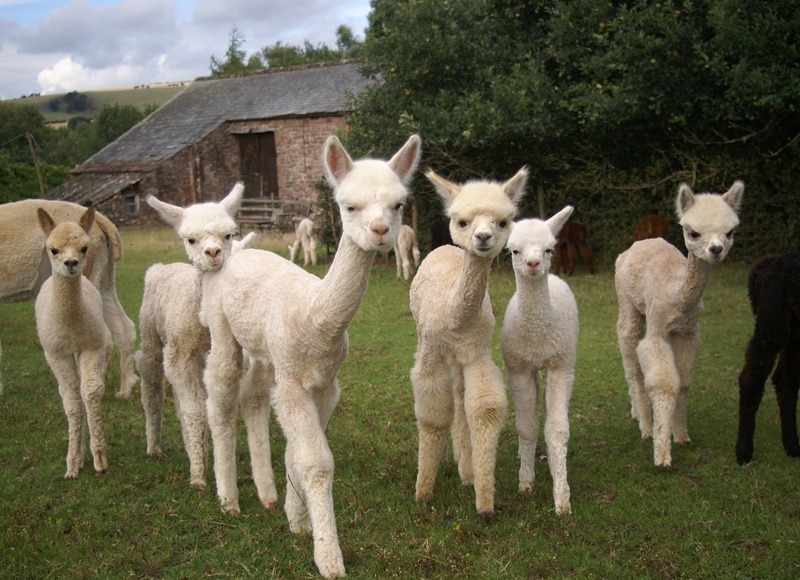 We don’t cria shear those less than 4 week of age, so will have a mixture of shorn and unshorn cria (aka haystacks). 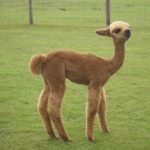 One female who has been repeatedly sitting at her pregnancy spit-off is the beautiful Cambridge Lady Gaga (Supreme Champion at 9 years of age). She had some history of this in 2017 when she went to see Claire Whitehead. 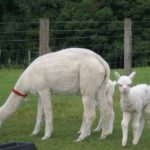 Thankfully after treatment for an infection she did have a cria this year. 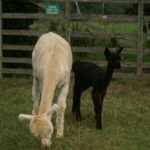 After 3 failed matings this year we decided to give her a course of antibiotics. Her fourth mating again failed. So it was decided it would be one last mating, and if this failed she would be retired. Of course I had spent lots of time deciding on the best pairing for Lady Gaga. This had set off as Eddie, but after failing , changed to Bozedown Blaze of Glory. Both very good choices. But as both had failed twice and I had really given up hope, I mated her with Beck Brow On The Money (brown champion)….because…I had him at the end of the rope when she sat. Yes of course she is now spitting off at pregnancy. Oh well we will see what we get! 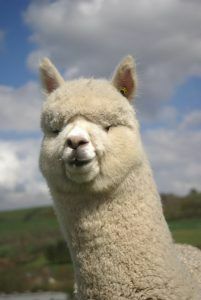 We have been Enferplex testing some alpacas today, who will be leaving us soon. This is a blood test taken to monitor for bTB. 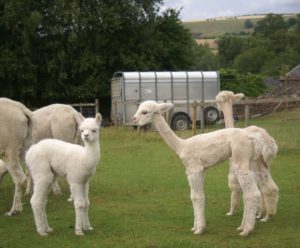 Although alpacas being exported only need to be skin tested (in most cases), this provides a low detection rate, therefore in addition to skin testing we voluntarily Enferplex test our pre-export alpacas, as well as surveillance testing those at home. Beck Brow First Edition (aka Lazy Eddie) – 1st placed Senior White Male. 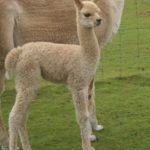 Beck Brow Vidal- 1st Junior Light, Champion Light Fleece. 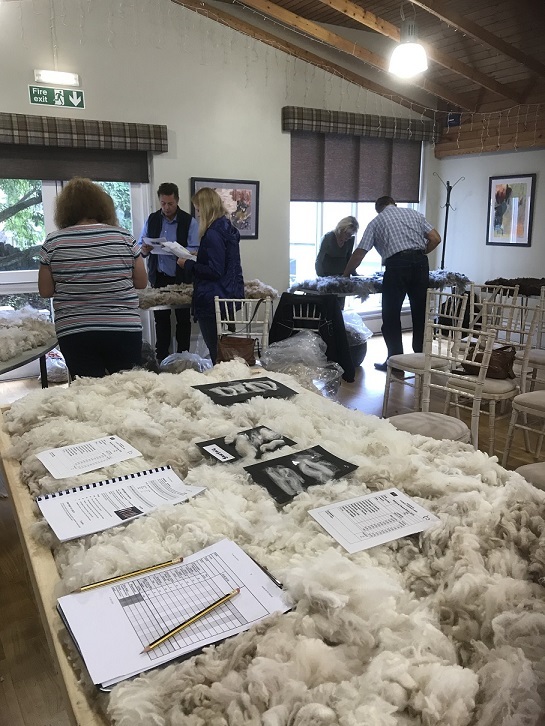 I had a lovely day yesterday up in Dunblane, where the Scottish Alpaca Group had invited me to hold a workshop on fleece skirting and assessment. There are such a friendly group, always eager to learn and share knowledge, I would highly recommend any alpaca owners in Scotland to get in touch with them via their Facebook page (if not already members).